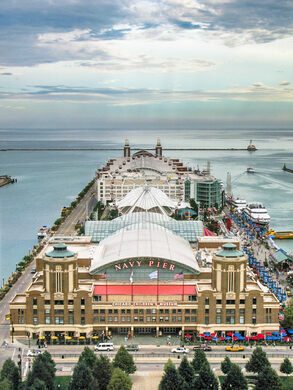 Historic Navy Pier U.S. Navy via "Heroes on Deck"
The Sable and Wolverine docked next to Navy Pier U.S. Navy via "Heroes on Deck"
Navy Pier is today one of the most visited attractions in Chicago, sporting a Ferris wheel and a touristy mix of shops and eateries. 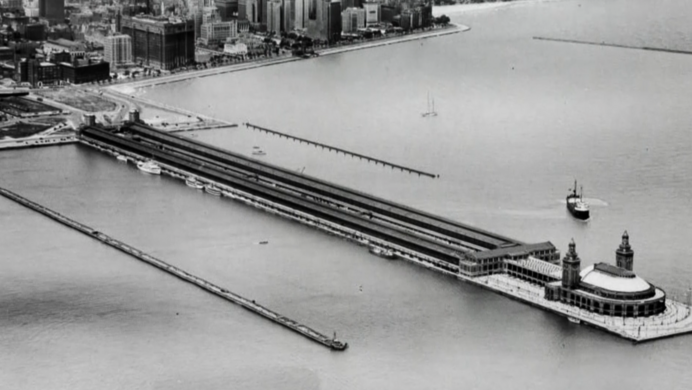 The scene couldn’t have been more different during the Second World War, when the U.S. Navy used the huge wharf as a training center for young aircraft carrier pilots. Site of a once beloved Polish diner, and location of a famous Hillary Clinton soundbite. 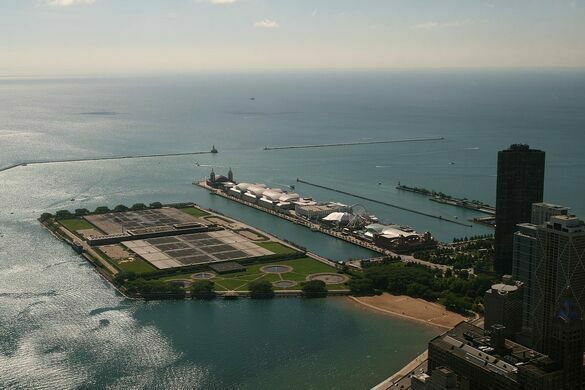 Illinois may not be the first place that comes to mind when you think of the U.S. Navy, but the landlocked Lake Michigan was an ideal location for young naval aviators during World War II, because it offered protection against Nazi U-Boats and Japanese Zeros. 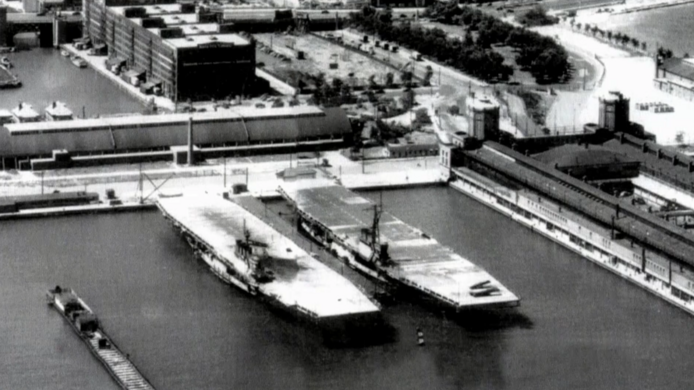 Two aircraft carriers were based at Navy Pier during the war, the USS Sable and USS Wolverine. 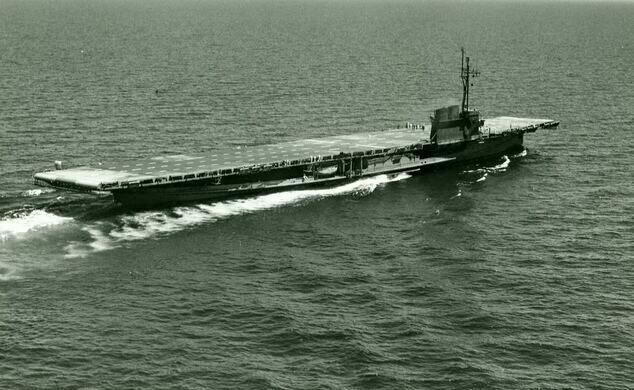 They were actually modified passenger ships, with flat top flight decks constructed over former luxury cabin space. The requisitioned ships were coal-fired, paddle-wheel vessels. Huge wooden wheels built into the sides propelled them through the water—essentially the same technology that carried Mark Twain up and down the Mississippi half a century earlier. The technical oddities didn’t end at the paddle wheels, however. Since the Sable and Wolverine were not combat vessels they received no armor or weaponry upgrades. The stubby flight decks were a mere 500 feet long, compared to the 800-foot standard Essex-class design. Over the course of the Second World War some 15,000 pilots (and future President George H.W. Bush) toured through Navy Yard and passed Carrier Qualifications on the Sable and Wolverine. 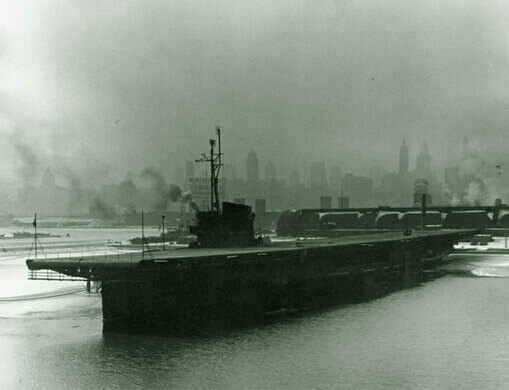 Just two months after Victory in Japan day, the Sable and Wolverine were decommissioned, and by 1947 both of the Navy’s unique paddlewheel aircraft carriers were sold as scrap. 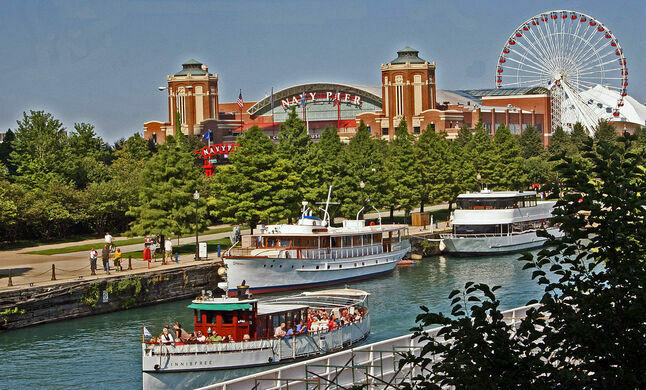 Navy Pier itself went through decades of underutilization until it was revitalized in 1989 as a tourist spot. One of the last remaining clues of Chicago’s carrier school past are the dozens of crashed aircraft that litter the floor of Lake Michigan to this day. The "Heroine of Dunkirk" rescued over 7,000 Allied troops during the historic World War II evacuation. After serving in Vietnam, Korea, and even a stint in the Turkish navy, the unique ship is now open as a museum.